The saying goes that the worst day of golf beats the best day of work. This is a presumably popular sentiment, as golf continues to capture the hearts, minds, and free time of people of all ages, with all skill levels, from hundreds of countries around the world. For many, there is no better way to enjoy a sunny morning than on the manicured greens (or, possibly, in the rough . . .), club in hand, with a friend or three, traversing the 18 holes of a golf course. And as August happens to be National Golf Month, we thought we’d take this opportunity to discuss why golf really is good for you, and how to make sure your body allows you to have the best golf game you can. Shank shots notwithstanding. 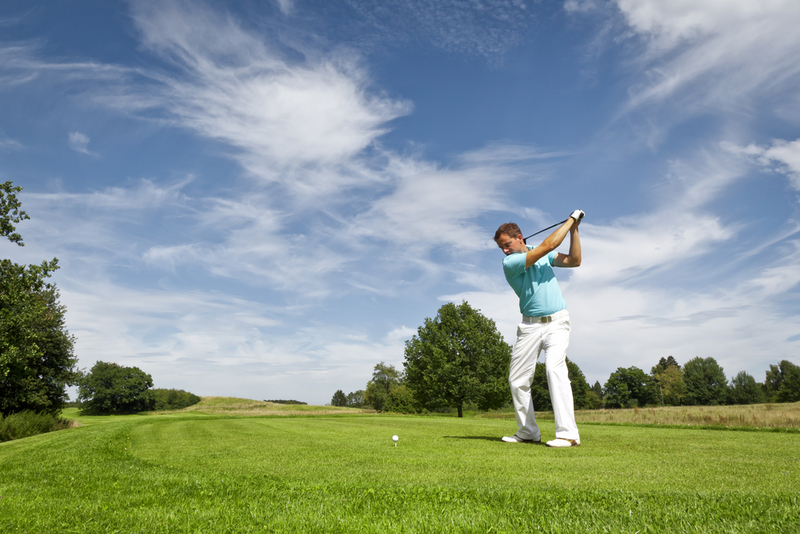 If your sore muscles the day after a round are any inclination, golf can be a pretty good form of exercise. Throughout the round you’re giving your core muscles (abdominals, glutes, back, and hips) a workout, as well as strengthening your upper body by swinging your clubs and in some cases carrying them yourself. Your chest and forearms get taxed, as well. And, if you’re the hard-core type and decide to walk the 18 holes? You’re logging about 5 miles per round. Nice work. If you’re going into your round with rigid muscles, or if you’re not properly conditioned, you can fall victim to some common golf-related injuries. From straining the lower back, to shoulder injuries, to neck strain, golf can either exacerbate existing sore areas, or create new ones. If your stance is off, you could develop strained tendons in your ankle or foot. The dreaded “golfer’s elbow” is a painful swelling or irritation of the outer or inner tendons of the elbow. Because much of golf involves a lot of repetitive motion, metabolic waste can build up around those muscles that are repeatedly taxed. This can cause pain and poor flexibility in those muscles, which are two things you definitely do not want as part of your golf game. Also, many injuries occur during a round of golf because of already-tight muscles that are flexed and strained during the swing. To keep muscles loose, healthy and fluid, regular massage therapy is a great way to practice preventative care during golf season. Your massage therapist can concentrate on the muscles in your neck, back, arms, hips, and glutes to help ensure that your muscles are loosened, more flexible, and lengthened. He or she can also pay special attention to the muscles that help support good posture, which is an important part of your golf stance. Massage therapy is great for helping to facilitate mental focus and decreasing stress and anxiety as well. Because going into a round of golf already stressed can lead to a very long and unpleasant 18 holes, especially after a couple of your favorite golf balls end up in the lake. Take the fact that August is National Golf Month as an excuse to hit the greens a few times. And if you pay some visits to your massage therapist before and after your games, it may end up being your best month of golf ever.